DPCI provided consulting services to implement a set of dynamic Drupal welcome pages as a new tab in the Foreign Affairs app library created using the Adobe Digital Publishing Suite. Foreign Affairs magazine is an American publication founded by the Council on Foreign Relations. Since its inception in 1922, Foreign Affairs has maintained a forum for scholarly discussions of American foreign policy and international affairs. The Council on Foreign Affairs was looking to enhance the user experience of the Foreign Affairs App and better represent the Foreign Affairs brand identity on the iPad. 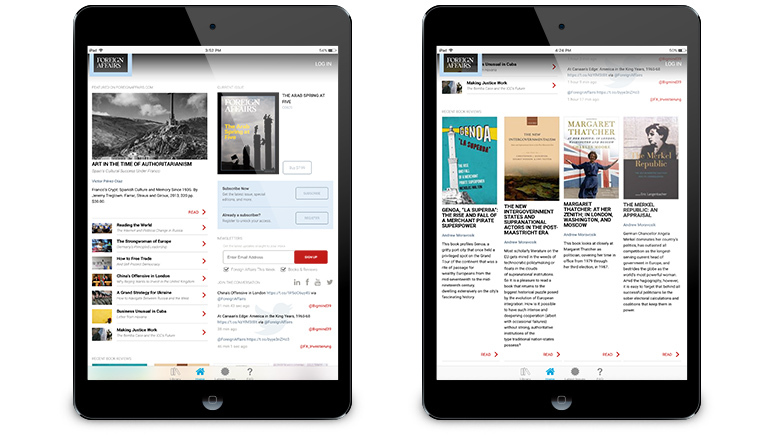 In the previous iOS application, readers were limited to viewing digital editions of the print magazine and iPad Extra issues on their device. This worked well for digital magazine access but left readers wanting more as Foreign Affairs has an abundance of extra digital content available through the website. 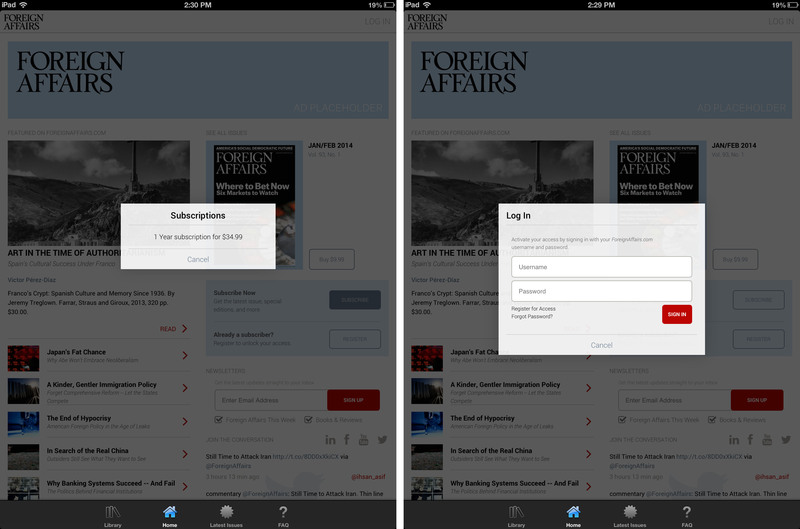 By incorporating a new app ‘home’ page, Foreign Affairs hoped to provide real-time foreignaffairs.com content to the iPad users, encourage subscription and newsletter signups, and create new advertising opportunities for sponsors. Foreign Affairs worked with DPCI previously to facilitate the launch of Foreign Affair’s premiere iPad application using the Adobe Digital Publishing Suite. That project had been viewed a great success so Foreign Affairs management brought DPCI in to present options and then implement a set of dynamic welcome pages as a new tab in the Foreign Affairs app library. To kick off the engagement, DPCI met with the stakeholders from both the marketing and development teams to further define the functionality and page layout for the custom app Welcome pages. DPCI then sketched the desired Web page layouts and functionality through wireframes, and worked together with Foreign Affairs to determine a look-and-feel that was fresh while remaining consistent with the Foreign Affairs brand. Once the development work was complete, DPCI configured a new tab in the Foreign Affairs DPS app library to utilize the new welcome pages. Prior to the launch of the new and improved Foreign Affairs’ iPad publication, DPCI quality assured the application end-to-end in accordance with Adobe DPS and Apple specifications. Since Foreign Affairs was already using Drupal for its website, extending Drupal to manage the app pages lets staff repurpose web content automatically without requiring the transfer of content into a separate system. In addition, Foreign Affairs marketing and development teams have full access to configure the app pages through Drupal. This gives Foreign Affairs staff the flexibility to reposition and change blocks as their goals, or the needs of their subscribers, evolve. 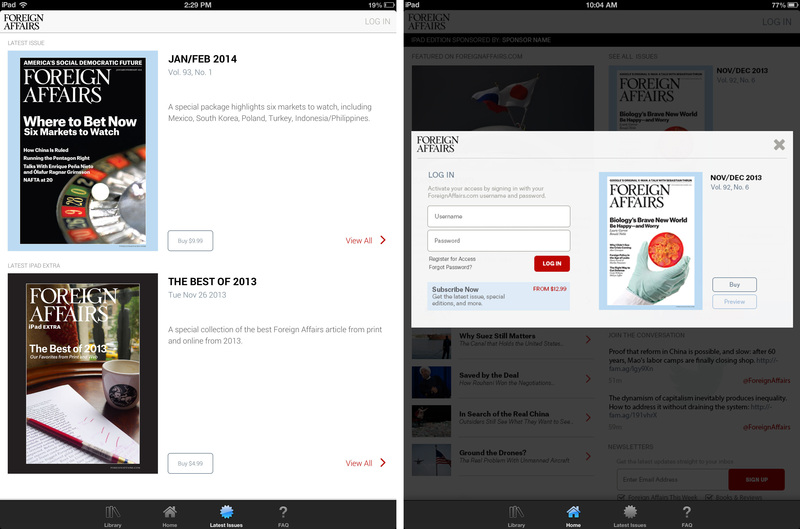 The updated Foreign Affairs tablet application launched in the Apple App Store in January of 2014. The application now launches with a dynamic welcome screen to further engage current readers and attract new subscribers. The custom welcome pages developed by DPCI include real-time content from foreignaffairs.com, a twitter feed, sponsor ads, sample folio content and promotions for in-app content such as the iPad Extra.